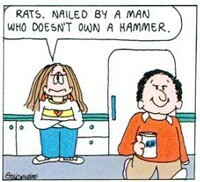 CATHY, the best comic strip in the history of ever, IS BEING DISCONTINUED AS OF OCTOBER. AND NOW IT'S BEING SILENCED. WTF. question: HOW DO YOU PLAN TO COPE? I'm calling a suicide hotline. chocolate!!!! Charles Schulz is dead and somehow Peanuts manages to be in the paper every Sunday. Can't they just compromise and cancel Garfield instead?